Here's the full list of Emmy 2017 winners. Television fans who tuned in to watch the 2017 Emmy Awards probably expected plenty of jokes at President Donald Trump's expense, and maybe even a heartfelt acceptance speech criticizing the Commander in Chief, a la Meryl Streep. What virtually no one expected was an appearance by a former employee of the Trump administration, let alone the much-maligned and Melissa McCarthy-parodied Sean Spicer. The currently unemployed press secretary, who got off to a rocky start in his previous position by adamantly claiming that the 2017 presidential inauguration was the most-watched election in history, despite visual and ratings evidence to the contrary, made a surprise appearance to poke fun at his truth-shifting reputation. Host Stephen Colbert called attention to Donald Trump's well-known affinity for television, before making a joke that he was probably watching, since the ratings for the Emmys would be so high. How high? Enter Spicer, chased by the ghost of his cynical past. With a wry smile and cutaways to a confused, somewhat horrified Melissa McCarthy, Spicer's visage appeared onscreen. 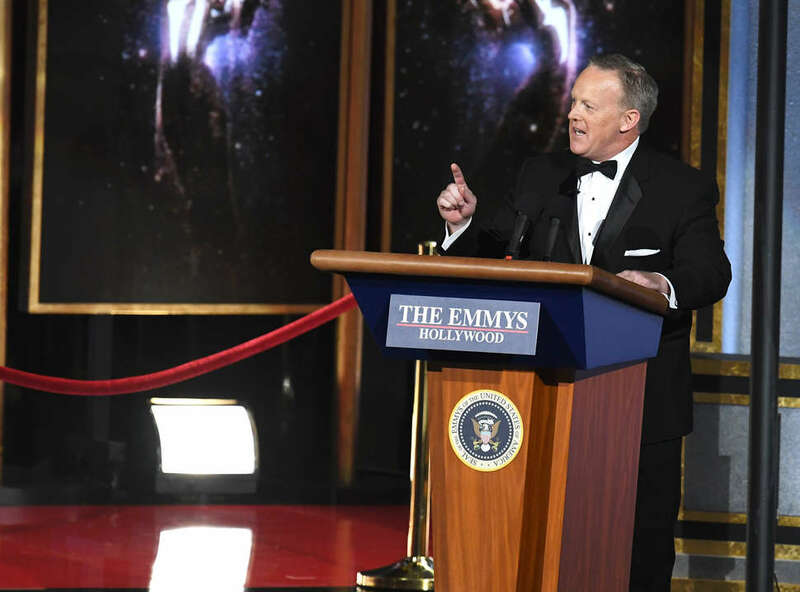 Yes, Spicer confirmed in an echo of his infamous press conferences, this would be the most-watched Emmy Awards around the world, like, ever. In case you were confused by the message, we are supposed to laugh at a man who explained to the world that Hitler never really used chemical weapons on his own people, told the public obvious lies about Trump's inauguration, or, more generally, accepted a job that would require him to defend xenophobia and explain away Trump's distaste for reading pesky things like proposed laws. Now he wants us to laugh at what a funny time that was. Ha. Ha. Ha. The 2017 Emmys, everyone!